Fairy lights, holographic flecks, rich jewel tones that shift in the light... does all that sound right for getting us through the cold-weather season, or what? Boy oh boy! 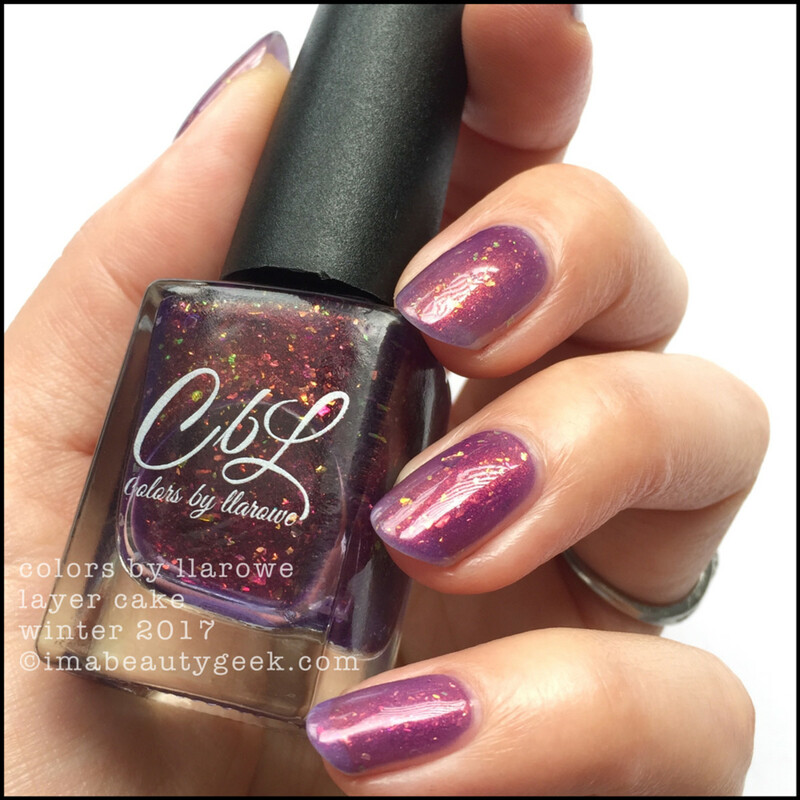 It’s exciting times here At The Salon (that’s code for me at my desk) because I’ve got a the Colors By Llarowe Winter 2017 Collection to show you! I’m fairly new to shooting holographic shades, and because they show so differently indoors in natural light as opposed to with big light and a side of grass, I’ve shot ‘em for you both ways. Everything I’m gonna show you is topped with a single coat of my Revlon Quick Dry Top Coat. Why that one? Because I love it, that’s why. Colors by Llarowe Parade of Lights – Winter 2017 (above). 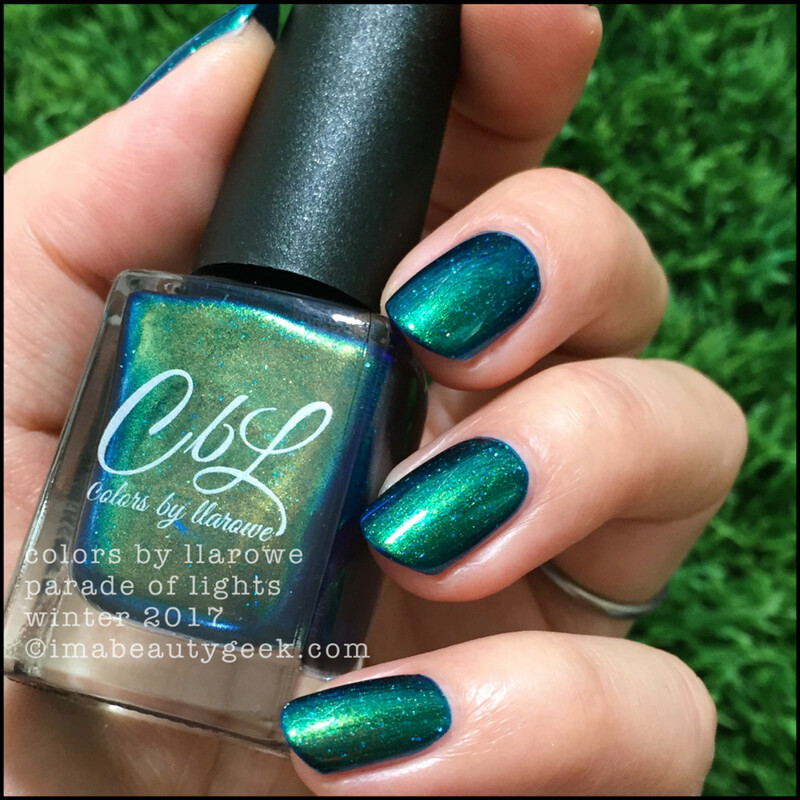 That’s 2 coats to get you to this amazeballz shifty blue-green flecked shade of beauty. 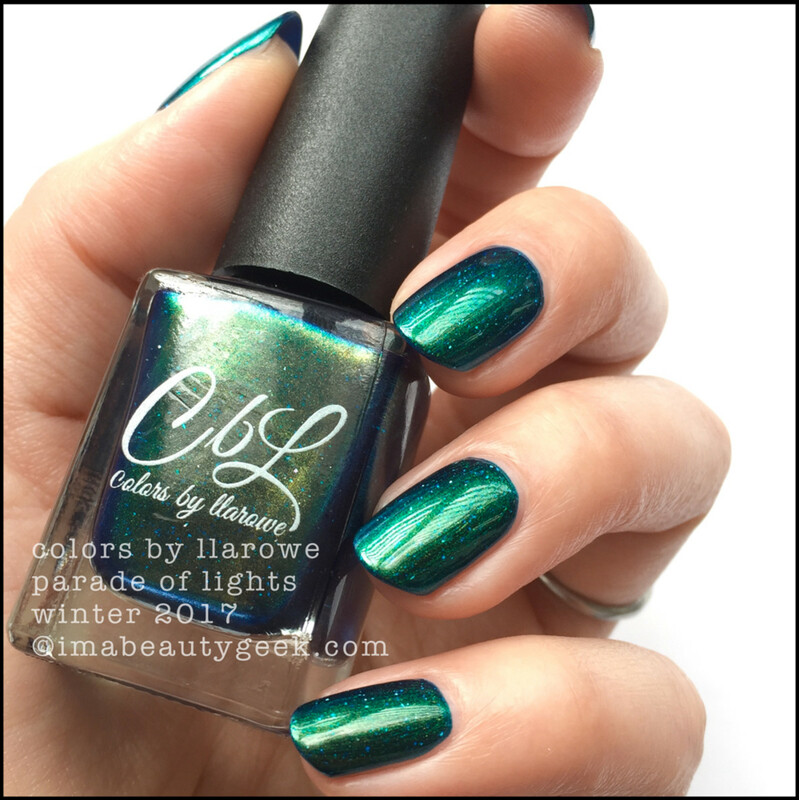 Colors by Llarowe Parade of Lights – Winter 2017 (above). With brighter light, you can totally see the little holo flecks in there that make this shifter look like it’s got little fairy lights in it. 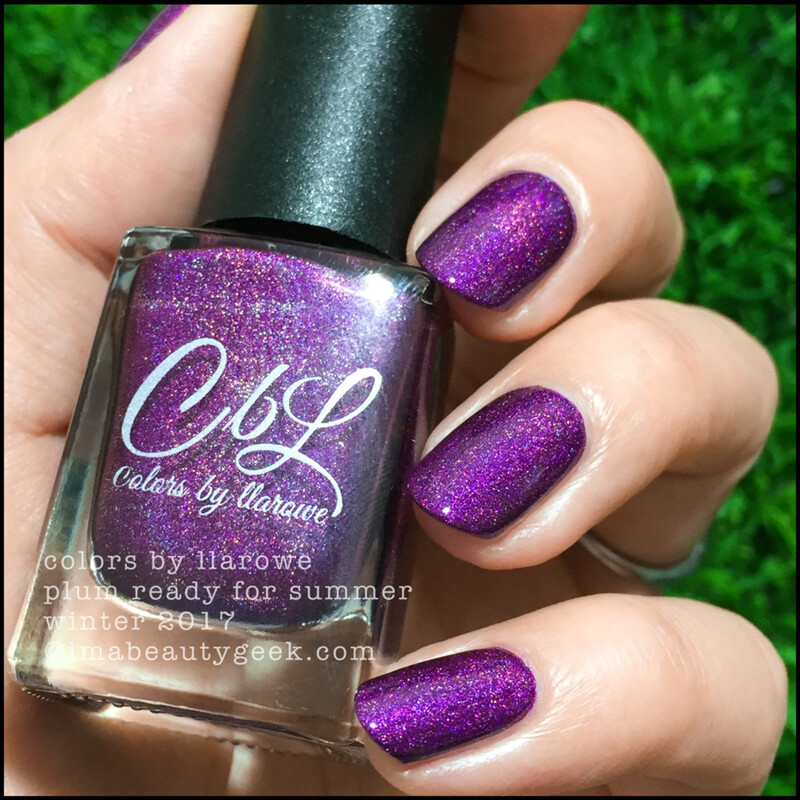 Colors by Llarowe Plum Ready for Summer – Winter 2017 (above). Holy crap! This was opaque in one coat! Just one! But I did 2 because I need maximum saturation for photos. I’m so in love with this shade. Indoors it’s a silvery cool, yet somehow warm deep plum that just gives me the #GrabbyHands. 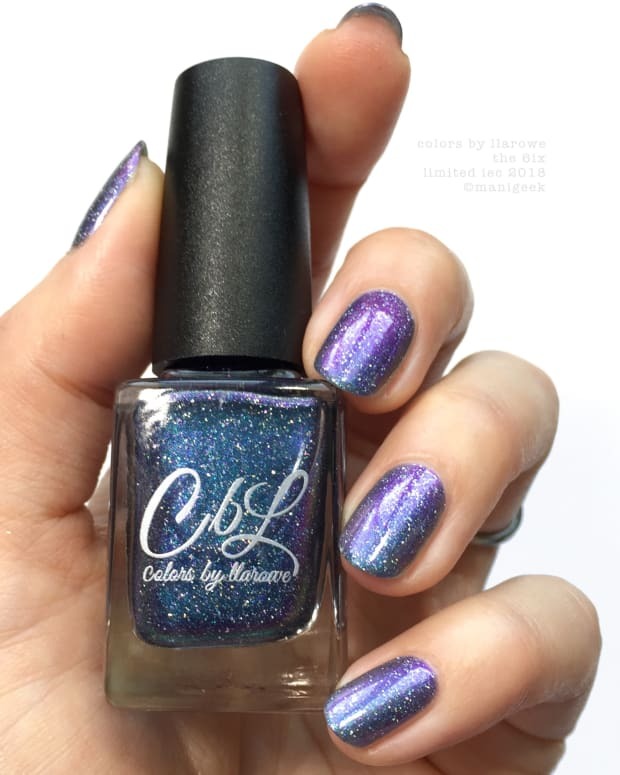 Colors by Llarowe Plum Ready for Summer (above). 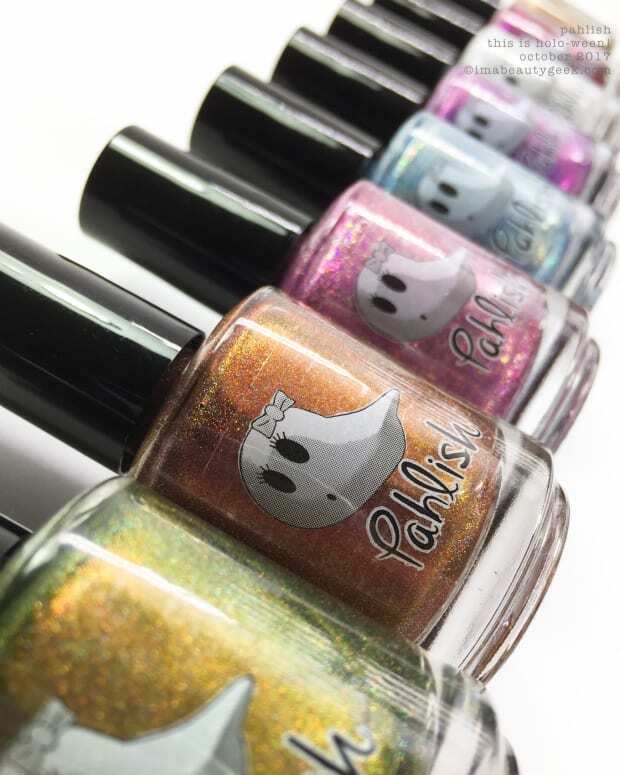 With a side of grass (aka salad), I popped you the holos! It’s crazy how glowy this thing gets when it’s whacked with big light. Colors by Llarowe Plum Ready for Summer (above). And one more time for good measure! Wheeee!!! 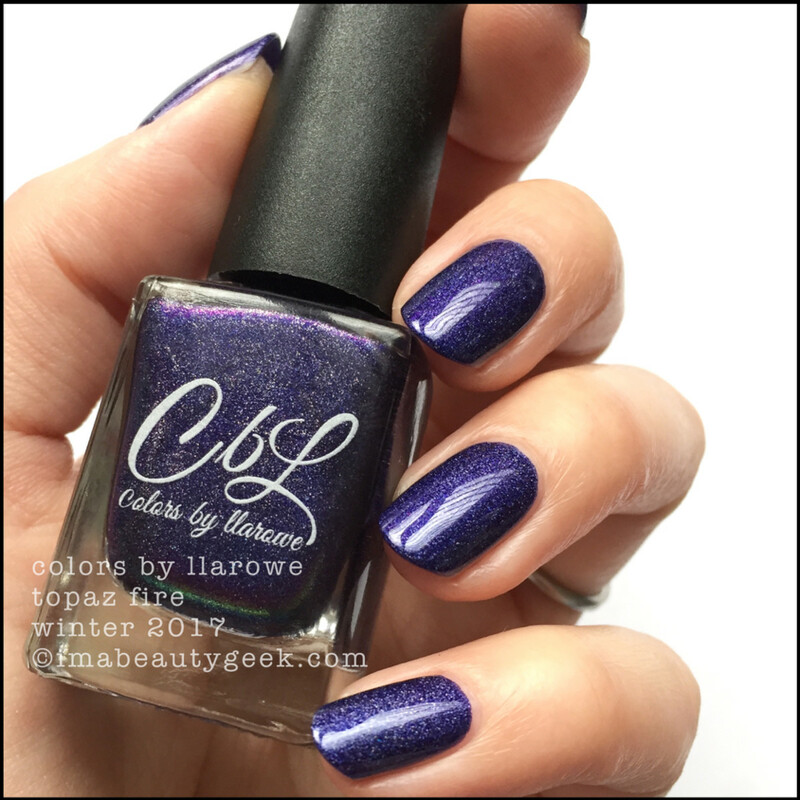 Colors by Llarowe Figgy Pudding – Winter 2017 (above). Golly. Like really, golly. I mean what else can I say about this blackberry jelly that looks like it’s set with flecks of precious gems? How many coats? 2 + top. Everything here has top because mostly, indies need top. Colors by Llarowe Figgy Pudding (above). Whacked with light and a side of salad, just look at those little prismatic holo flakies! I can’t even. It looks like candy. Now I want candy. Or a jelly sammich. 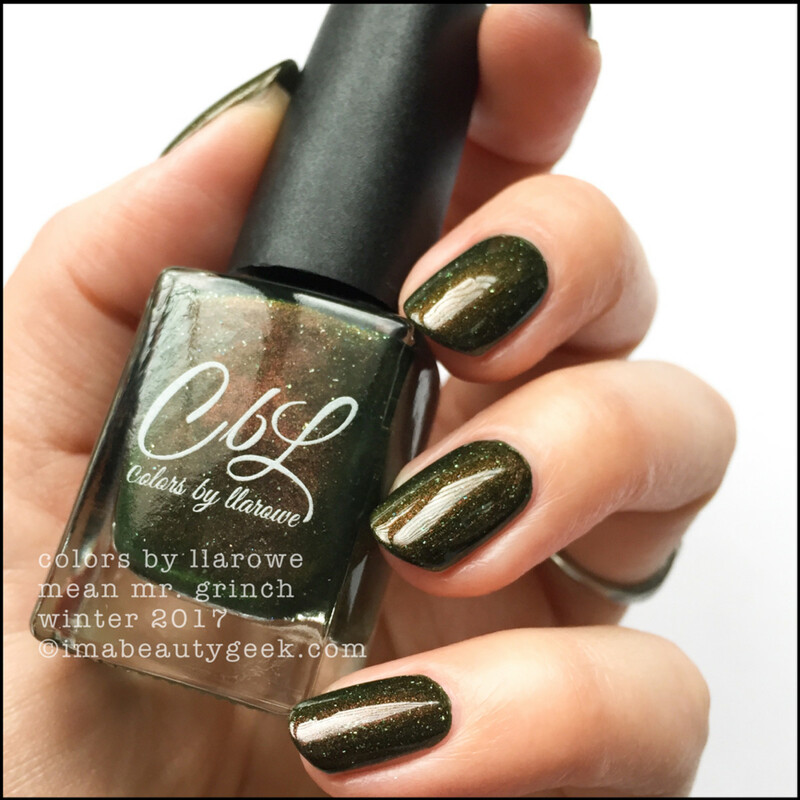 Colors by Llarowe Mean Mr. Grinch - Winter 2017 (above). I know someone who is going to 1-jillion-% need this shade! It’s a heckuva shifter that shimmers from green to copper to black. Indoors, it’s like a greeny oil slick and I can’t stop staring at it. 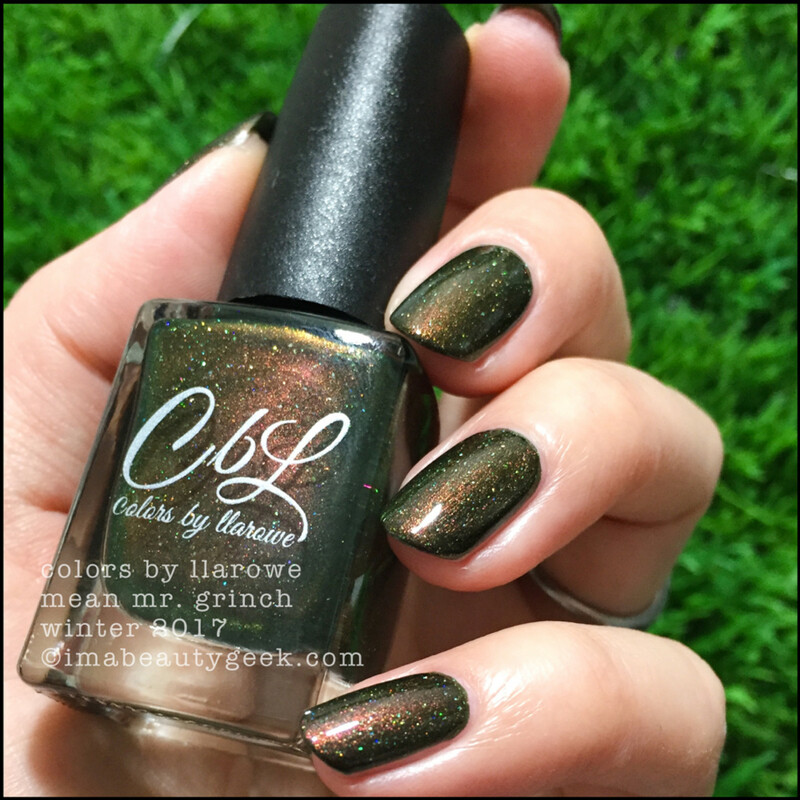 Colors by Llarowe Mean Mr. Grinch (above). With a bunch of salad under it, the coppery brown really comes out to play and the green shimmer gives it a fascinating, almost metallic overlay. It’s freakin’ outstanding! 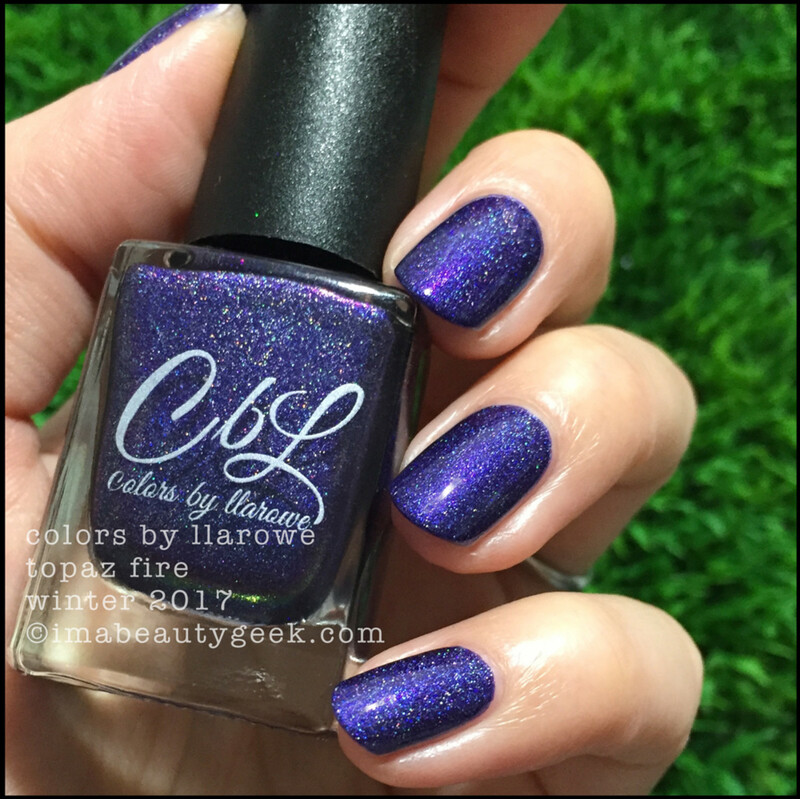 Colors by Llarowe Topaz Fire – Winter 2017 (above). That silvery-ness in saturated shades gets me every.single.time. Must have. Must. Colors by Llarowe Topaz Fire (above). Add more light and she’s very nearly a navy purple, and the silvery you see indoors turns into glowy rainbow prismatic holo. You wannit. I know you do. I understand. 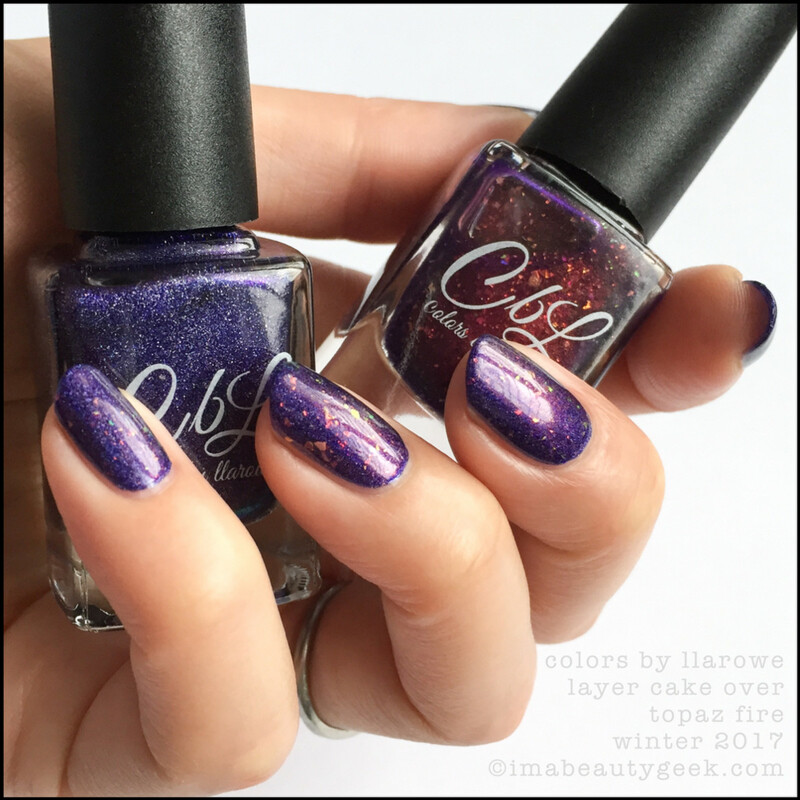 Colors by Llarowe Layer Cake over Topaz Fire – Winter 2017 (above). This right here is one single coat of Layer Cake over 2 of Topaz Fire. The Cake is a sheer pinky purple base stuffed with multi-shifting flakies. Over darks with hints of purple, she’s stunning. Colors by Llarowe Layer Cake over Topaz Fire (above). Here, enjoy another shot! And check out my ring finger to see how many colours you can get from them flakies! 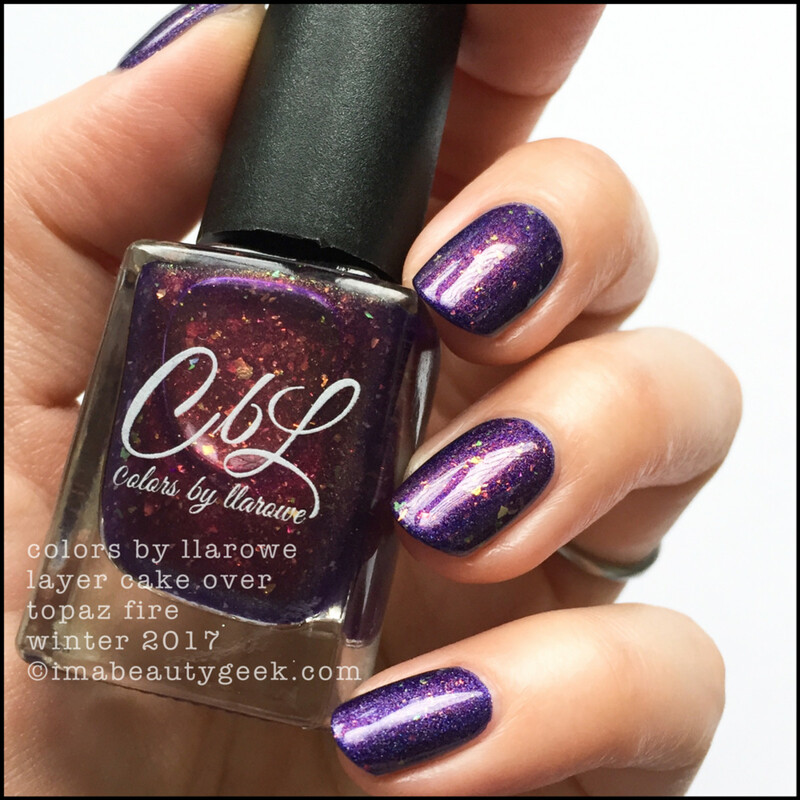 Colors by Llarowe Layer Cake – Winter 2017 (above). Finally, if you’re wondering if you can build a cake just by layering, you can! It took me 4 thin coats to get what you see there, and while I do still have slight visible nail lines, I can really dig this for any of the holiday times! 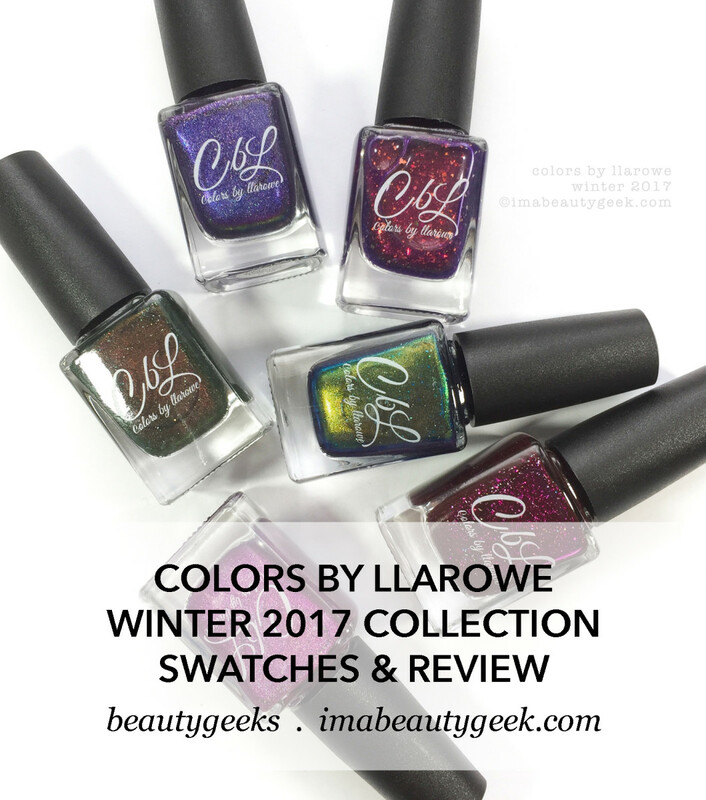 And that brings us to the end of the Colors by Llarowe Winter 2017 Collection. There’s a bunch of housekeeping things for me to add here and if you’re new to this brand, it’s stuff you should probably read. Winter 2017 launches Wednesday, November 1 at 12pm MST (Colorado!) and will be available for order at www.llarowe.com until November 8, 12pm Mountain Time. As of now, www.llarowe.com will be open for all ordering only during the first week of every month. If you log in at any other time, all products will appear as “out of stock” and you won’t be able to buy any of the pretties. You’ll want to mark your calendars and make yourself some sticky notes for the bathroom mirrors, k? Further, for those of you new to CbL, it’s a good idea to wander around their site and look at things like FAQs, Shipping Info, Rewards Points, and also Sale (because... sale). I know lots of you are already good to go, but some of you are relatively new to the world of Indie Polish and Indies don’t run the same way Amazon does; they’re smaller and much more intimate. Now let’s discuss Winter 2017 and what bottles you neeeeeed to have! Me, I’ve got them ALL so I’m just sitting here grinning like a dork.